Eating that extra slice of pizza, an online shopping spree, or ignoring the “check engine” light on our dashboard: human beings do not always make decisions in our own best interest. We often focus on immediate emotions (deprivation, desire for new stuff, fear of car repair bill) and fail to consider long-term consequences (weight gain, credit card debt, lack of transportation). The study of why we make these irrational decisions is called behavioral economics. It is especially instructive when figuring out ways to engage employees in their health savings accounts (HSAs). After all, 4 in 10 of those with access to an HSA aren’t taking advantage of them, while only 25 percent of employees consider medical costs and saving in a HSA as a top financial priority. want to spend money on more immediate needs. The Bend HSA learns from the employees’ behaviors and patterns and, through the Bend Advisor, offers actionable suggestions to help overcome savings obstacles and nudge employees toward more rational, healthier decisions. Education: Poor decisions are often the result of a lack of understanding. The Bend Advisor learns individual behaviors and situations, identifies qualified medical expenses and delivers actionable advice on how to affordably fund their HSA. Automation: By automatically pulling this data from checking, savings, credit card and other accounts, the Bend Advisor supports and guides employees’ decisions, requiring virtually no extra effort on their end. This automation simplifies HSA management for employees, which can help increase engagement while educating them about funding opportunities. Positive feedback loop: At the same time, too many options can feel overwhelming, which means many of us resort to our more comfortable default choice. That often results in no action at all. The Bend Advisor overcomes this inertia through targeted guidance and feedback that together drive positive change. 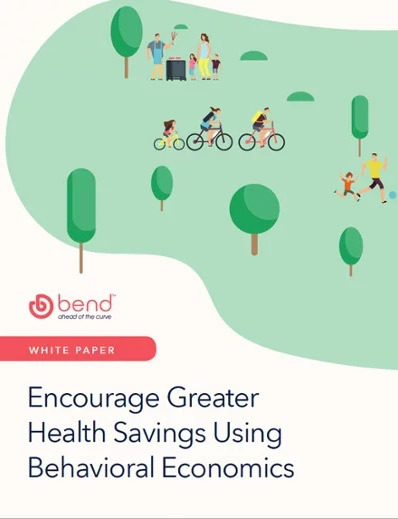 For example, if an employee has incurred more healthcare expenses than they are projected to contribute, the Bend Advisor offers suggestions for increasing their contributions, highlighting potential tax savings and making the process as easy as a click of a button. When saving for health care, it’s often too little, too late. However, by creating simple and intuitive choices, nudge messaging, and a path of least resistance, The Bend Advisor can influence positive decisions and greater employee HSA engagement. As engagement builds, so will employees’ financial literacy, account balances and confidence in the HSA.